Stretch Tuesday has quickly rolled around again. Love seeing all of the beautiful new purchases that you have found in stretch and carnival glass. New finds and sharing them are the best part of collecting. Three weeks ago, we showed a variety of stretch glass blue colors that the different glass companies produced. Today we would like to continue with the stretch glass colors theme in red and amberina. True red glass is made with selenium not gold. Adding gold to a glass mixture makes a cranberry color. Selenium makes a very rich red color. All kinds of variables make for color differences on the glass. Since we are not in a chemistry class, we’ll stay with the very, very basic principles. Diamond Glassware Company made a “Ruby Lustre” which is a shiny gold or silver iridescence to one surface of the red bowl or candlesticks. Best known pieces are the “Mae West” candlesticks. Below is a footed bowl with a shiny finish inside. 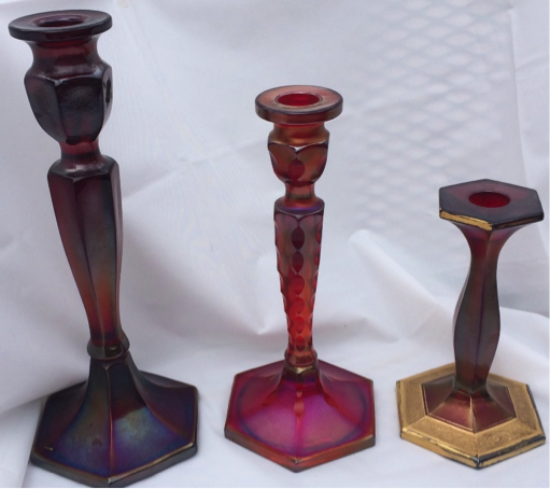 Most stretch glass collectors really don’t consider “Ruby Lustre” as stretch glass, but have examples in their collections. 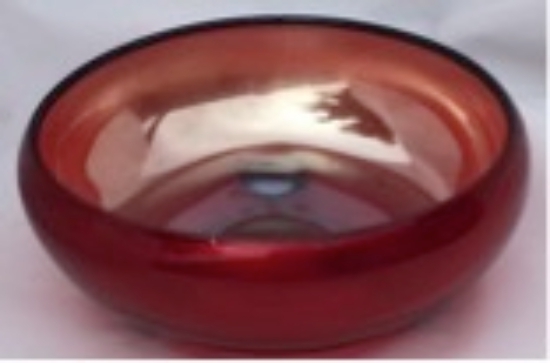 Diamond did make red stretch glass which is a light bright red glass as well as a covered bonbon in amberina. Thought that we had several pieces, but when we measured them; they had Fenton measurements! Diamond did not make many pieces of red stretch glass. Fenton Art Glass Company was the manufacturer of most of the true red pieces which they called “Ruby”. 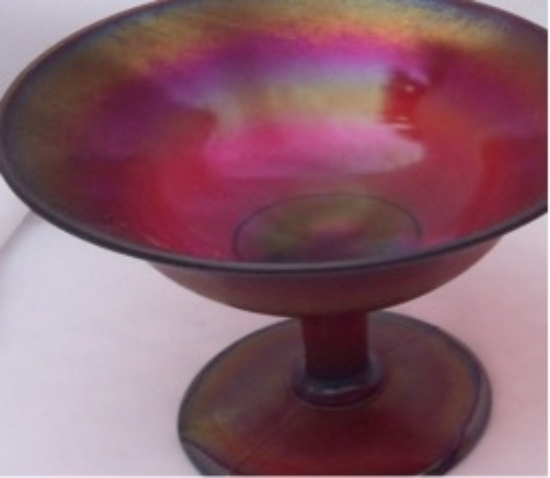 Fenton made the true dark ruby bowls with no amberina color by iridizing only the interior of the bowls. Had fun photographing the bowl shown on the left as there was a reflection of the trees and myself on the uniridized outside of the bowl. It was like photographing a mirror; you can see the trees on the side of the bowl! 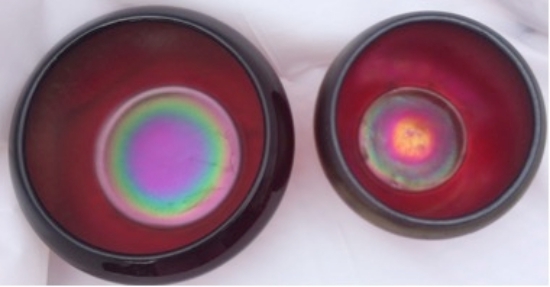 The bowl on the right side in the pictures below are iridized on both sides. They made two different styles of candy jars in “Ruby” although one is considerably lighter than the other one. The first candy jar is a # 9 and would hold ¾ lb. On the right side, #736 candy jar is a rib optic and would hold a full 1 lb. Fenton’s #103 sherbet is in a beautiful rich dark red. Fenton’s red candlesticks are always desirable. The 10 ½” candlestick on the left is #349. The middle candlestick is #449 in “Cut Ovals” with the ovals all cut by hand. It took an experienced worker to cut all of the ovals the same size on the candlestick. Fenton started out as a glass decorating shop before turning the business into making glass. Until they closed, Fenton had continued with hand decorating some of the glass that they made. But applying the embossed gold decoration was done by another company besides Fenton. That is the reason why, sometimes you will find the same gold embossing pattern on glass from different factories. If for some reason the embossed gold decoration is removed, the outline of the gold band with the decoration remains on the glass most of the time. The “Portly” #249 candlesticks are around 6 ½” high with gold embossing on the base and gold paint on the top edge. 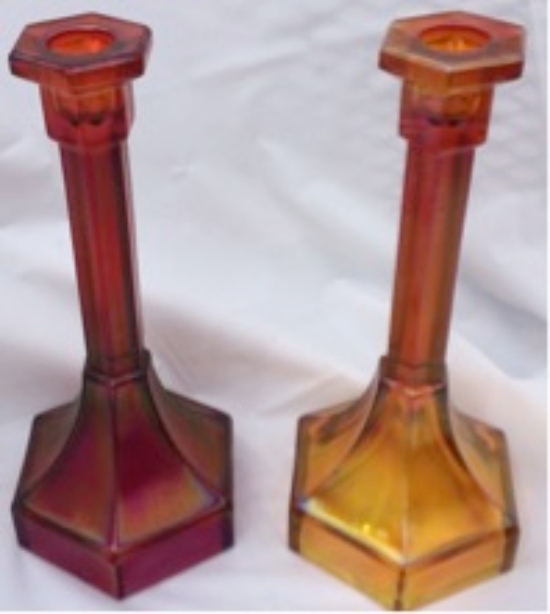 Imperial Glass Company is famous for Amberina/red stretch glass. We are talking about their base glass color not the color of the iridescence. The pieces do vary in amberina/red color from piece to piece. Remember that quality control in the teens and twenties was not what it is today. They made glass to sell! The compote on the left is 4 ½” high by 6 1/2'” wide in the Chesterfield pattern. The one in the middle is also a Chesterfield #600 sherbet. The one on the right is #499 optic rays sherbet. These two #6009 Chesterfield candlesticks are both amberina/red. The one on the left is close to a true red, but the one on the right is truly amberina with little red coloring. Finding mates for these candlesticks is nearly impossible! 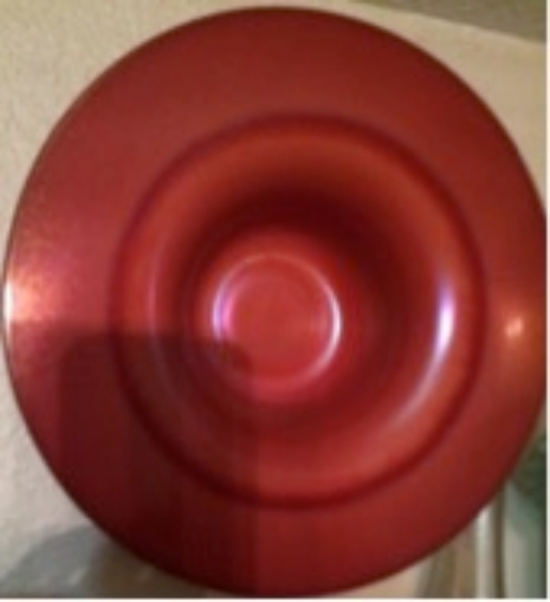 As far as we know, H. Northwood & Company did not make any red stretch glass. Even in carnival glass, the reds were mainly produced later in the late twenties, and then not for many years. The United States Glass Company even though it was comprised of a variety of glass companies only one made the “Red Slag”. Red slag is rare. Back in the early 1970’s at the Stanton, Virginia American Carnival Glass Convention someone showed us a red slag bowl in stretch glass. We really wanted it, but the person had just found it and didn’t want to part with it. Thought we would easily find one. Rose Schleede would send us a picture of a super piece of stretch glass that she had just acquired each year with her Christmas Card. One year, she sent us a picture of the #179 red slag bowl; this time we knew how rare it was! It is 9 ¼” wide and 2 7/8” high. We hope that you have enjoyed the Reds and Amberinas in stretch glass. Red and amberina are difficult to find just like the ones in carnival glass, but they certainly add a lot of vibrant color to any collection. 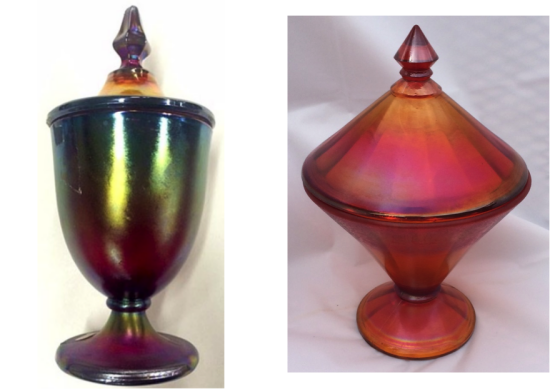 Hopefully since we have shown you some of the reds and amberinas in stretch glass, you’ll send in photos of the reds and amberinas that you have in stretch and/or carnival glass. Think we have a new stretch glass collector. This little guy was so interested in watching me photograph the red glass outside. 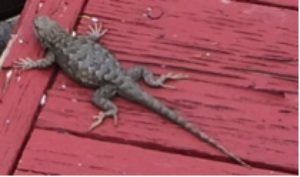 He would watch me go back and forth to bring new glass outside and then take it back in. He was with me the whole three hours with his eyes open. After 10 minutes my dog is bored takes a nap while I work!